With a thrilling 47-ball hundred, Worcestershire’s Vikram Solanki has stormed into pole position in the chase for this year’s Walter Lawrence Trophy. The 33-year-old Worcestershire captain’s century included 14 fours and 2 sixes and helped his side crush Glamorgan by 101 runs in the T20 match at New Road, Worcester on June 24. Celebrating its 75th year, the Trophy, awarded for the fastest hundred of the season, is open to all domestic county competitions, with centuries scored in the Friends Provident Trophy (50-over format), NatWest Pro40 League (40-over format), Twenty20 Cup (20-over format) and the County Championship all qualifying, as well as Test Matches, One-Day Internationals and Twenty20 Internationals played in England. The winner will be presented with the Trophy and a cheque for £5,000 at a special end-of-season lunch. The winner of the Walter Lawrence Trophy award, of a silver medallion and prize of £1,000, for the highest score by a batsman from the six MCC Universities against one of the other five University Centres of Cricketing Excellence or against one of the first-class counties is Anand Ashok of Cambridge UCCE. 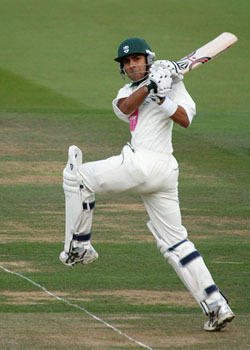 Ashok scored an unbeaten 164 against Oxford UCCE at Fenner’s on June 21.